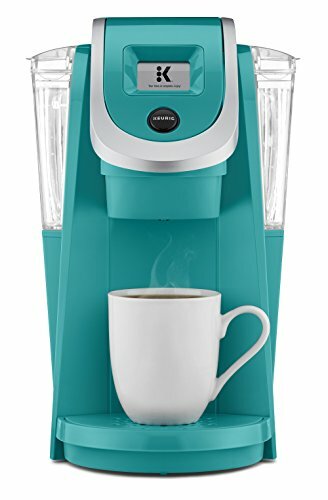 A Slim and Sleek Keurig Single Serve Coffee Maker, the Keurig K250 brews a rich, smooth, and delicious cup every time with the quality you expect from Keurig. With a strength control setting for a bolder brew, and multiple K-Cup, K-Mug, and K-Carafe pod brew sizes, you can customize your settings to get your perfect cup. Plus, an easy-to-use touch screen makes your brewing experience stress free. Whether you like your coffee strong, mild, decaf, or flavored, you can brew all of your favorites with the Keurig K250 – and with large 48oz water reservoir, you can brew 6+ cups before having to refill. Discover hundreds of K-Cup pod varieties from all of the brands you love, including Green Mountain Coffee, Starbucks, and Lipton, and enjoy coffee, tea, hot cocoa and more. Available in a variety of fun colors to complement any décor, and also compatible with the Keurig Plus Series My K-Cup Reusable Coffee Filter, so you can brew your own ground coffee.